Yellow flags and rain fell at just the right times for Mike Bliss Saturday night at Lowe’s Motor Speedway and the result was his first Nationwide Series victory in 83 races. The final batch of rain began to fall with 32 laps to go in the race. Two laps later, NASCAR officials brought the field into the pits and Bliss, who took the lead when cars ahead of him were pitting under green when a caution was called with about 50 laps to go, had his victory. Brendan Gaughan, who also reaped the benefits of the caution with about 50 to go, finished second. Just before the rains fell, Gaughan had actually took the lead away from Bliss for a total of four laps. But Bliss came back, recaptured the lead with 33 laps to go and a lap later, the rains came. Kyle Busch, who led a race-best 98 laps Saturday, was third and Brian Vickers was fourth. Carl Edwards, who started the race from the pole and second in the standings behind Busch, finished 10th. He had led 37 laps early. That enabled Busch to stretch his lead over Edwards in the standings to 73 points. The victory was the second of Bliss’ Nationwide career. His other victory also came at Lowe’s, that in 2004. 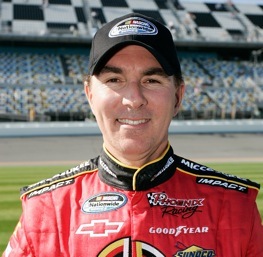 Gaughan, a rookie, had his best career finish in the series.